I'm fighting a bit of a cold, but decided I needed to get on the computer to try to help someone who's fighting something a hell of a lot bigger. 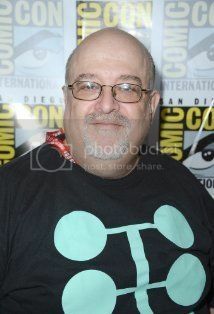 Peter David (or PAD as many of his fans know him) was the first person to make me realize comic books had writers; which is to say he was the first comic book writer whose work so impressed me that I was curious enough to find out his name. He wrote Incredible Hulk for 12 years - longer, as far as I know, than any writer has stayed on Incredible Hulk and much longer than most writers have stayed on any single title, especially these days - and impacted my creative life profoundly. He's written for shows like Babylon 5, novels for Star Trek, and for a while there he wrote pretty much every novelization of every Marvel movie. More recently, he's been writing Marvel's X-Factor. He is not only a wonderful writer but a man of admirable integrity who has a history of publicly thumbing his nose at the higher-ups when he thinks they're heads are up their asses. PAD suffered a stroke recently and his wife Kathleen posted on his blog to let folks know how they can help. They have health insurance but there are significant charges their insurance simply won't cover, and apparently this is compounded by the fact that the stroke occurred at the end of the year. Kathleen is asking folks to check out PAD's e-books available through ComicMix. The e-books available include The Camelot Papers, Pulling up Stakes Part 1 & 2, Darkness of the Light and Heights of the Depths. Buying these books is the most immediate way to help PAD, as his percentage of the money is higher and it gets to him quickly. I don't have as much experience with PAD's prose work and I haven't read any of these books, but I did read his first two Sir Apropos of Nothing novels and both were hilarious, awesome reads. He has a sensibility and sense of humor not unlike Joss Whedon. Any fans of Buffy or Firefly would do well to check him out. You can also buy some of his graphic novel collections through sites like Amazon and Barnes & Noble. Kathleen says this does help but, "that is very long term and isn't much per books but it does help especially the Marvel graphic novels he has written." I am going to use this as an opportunity to spend money on graphic novels and books guilt-free, and I suggest you do the same. If you're curious, I've written some reviews of PAD's Hulk work, my favorite being my piece of his historic final issue of Incredible Hulk. You can find the links below. I think this is a great thing you are doing for a true artist. Your writing is inspired and unique as well. I'll be coming back to read more for certain.